First of all let me describe that why an access issue comes on windows 7. 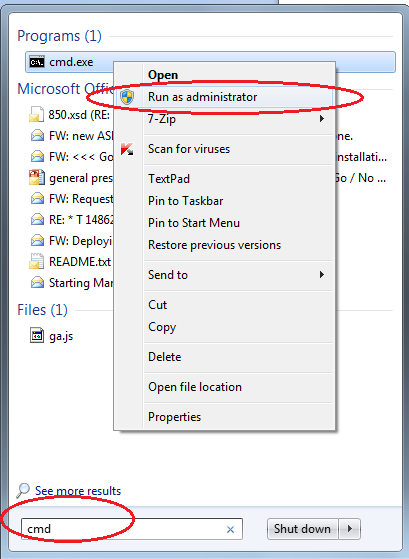 In Windows 7, by default only limited set of programs are executed as an “Administrator” even if you are logged in as an Admin user. 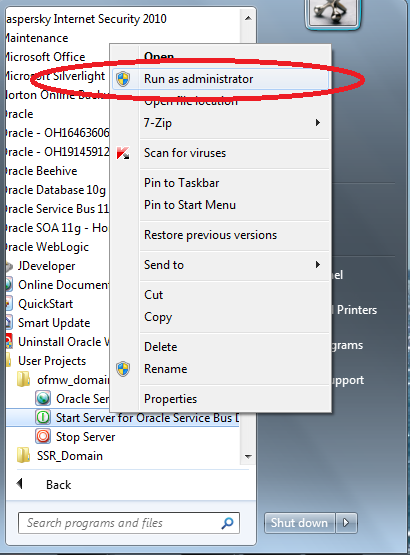 To start a normal program as Admin, you have to do it explicitly. Microsoft has already released a note on the same here. 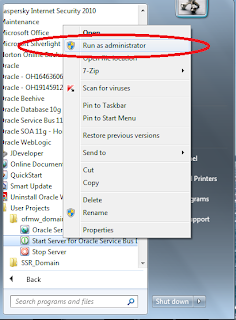 So let’s see how we can start Weblogic (SOA & OSB) servers on windows 7 with Admin access. c) If prompted by UAC (User Account Control), then click on Yes to apply permission to allow the program to run with full permission as an administrator. NOTE: If you are doing this, while logged in as standard user instead of an administrator, then you will need to provide the administrator's password before the program will run as administrator. b) If prompted by UAC (User Account Control), then click on Yes to apply permission to allow the program to run with full permission as an administrator. c) Now as usual, navigate to $Domain_Home/bin directory and execute startManagedWeblogic.cmd with server name as argument to start the managed server. If you still face an issue, raise a thread in OTN SOA Suite forum with details. Enjoy SOA suite 11g on Windows 7. Thanks it was helpful to me..
To avoid abrupt closing of command window when starting an Oracle WebLogic Server with the startWebLogic.cmd/.sh script, edit the domain's setDomainEnv.cmd/.sh script and set doExitFlag=false. From the error it seems you are opening a URL in browser which does not exist. Make sure that you are trying to access a page which really exists and host/port information is correct. I'm unable to invoke "Configuration Wizard" to create Weblogic Domain and when i tried to run from C:\Oracle\Middleware\oracle_common\common\bin, I'm getting error as: "Windows cannot access the specified device,path or file. You may not have the appropriate permissions to access the item". For your information while applying patch(ofm_soa_generic_11.1.1.3.0) installation for Soa Suite(ofm_soa_generic_11.1.12.0) i did got a message like "your installation might not be done successfully" eventhough I did see "100%" sucessfull message, also for your information my machine is Windows 7 64 bit and i used wls_1033_generic.jar,Oracle XE database for installation. Kindly let me know how to proceed from here.....................much awaiting for your reply, Thank You. 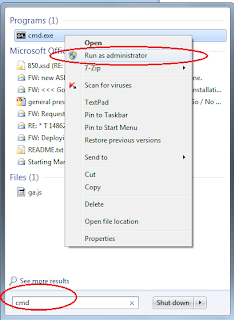 Go to directory $MW_Home\wlserver_10.3\common\bin\, right click on config.exe and select "Run as administrator" option. It will open up the configuration wizard to create the domain. This application is deployed on the first access. You can change this application to instead deploy during startup. I'm very new to Weblogic. Since OBIEE 11g requires weblogic, i was foreced to use it. I have installed the weblogic on my Windows7 64 bit using 32 bit installer and installation was smooth. Everything was fine and i was able to access the application home page post installation. However, once i restarted the machine, the weblogic server startup is stuck at a step called "initializing self-tuning thread pool" and it won't move from there. Please throw some light on this. Thanks in advance. DreamHost is definitely one of the best hosting provider with plans for all of your hosting requirments.